One of the Sunday Times’s Top Fifty Summer reads – ‘Extravagant portrait of . . . power and decadence’ In the Name of the Family – as Blood and Beauty did before – holds up a mirror to a turbulent moment of history, sweeping aside the myths to bring alive the real Borgia family; complicated, brutal, passionate and glorious. Here is a thrilling exploration of the House of Borgia’s doomed years, in the company of a young diplomat named Niccolo Machiavelli. It is 1502 and Rodrigo Borgia, a self-confessed womaniser and master of political corruption is now on the Papal throne as Alexander VI. His daughter Lucrezia, aged twenty-two, already thrice married and a pawn in her father’s plans, is discovering her own power. And then there is Cesare Borgia: brilliant, ruthless and increasingly unstable; it is his relationship with the diplomat Machiavelli which offers a master class on the dark arts of power and politics. What Machiavelli learns will go on to inform his great work of modern politics, The Prince. But while the pope rails against old age and his son’s increasing maverick behavior it is Lucrezia who will become the Borgia survivor: taking on her enemies and creating her own place in history. 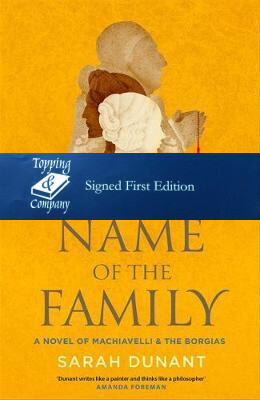 Conjuring up the past in all its complexity, horror and pleasures, In The Name of the Family confirms Sarah Dunant’s place as the leading novelist of the Renaissance and one of the most acclaimed historical fiction writers of our age.